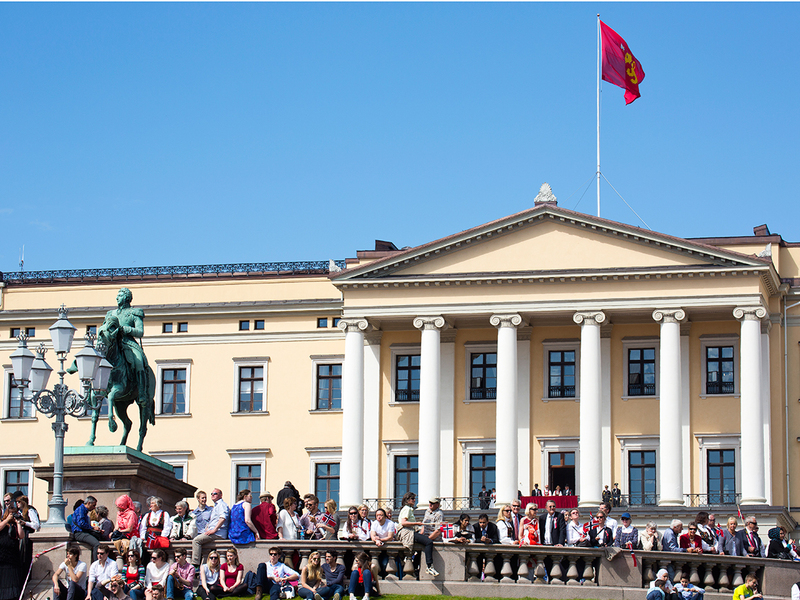 Most days of the year the flag of His Majesty The King, the Royal Standard of Norway, flies over the Royal Palace. But the Royal Standard is not the only flag used at the Palace. Fixed rules determine which flag is used at any given time. 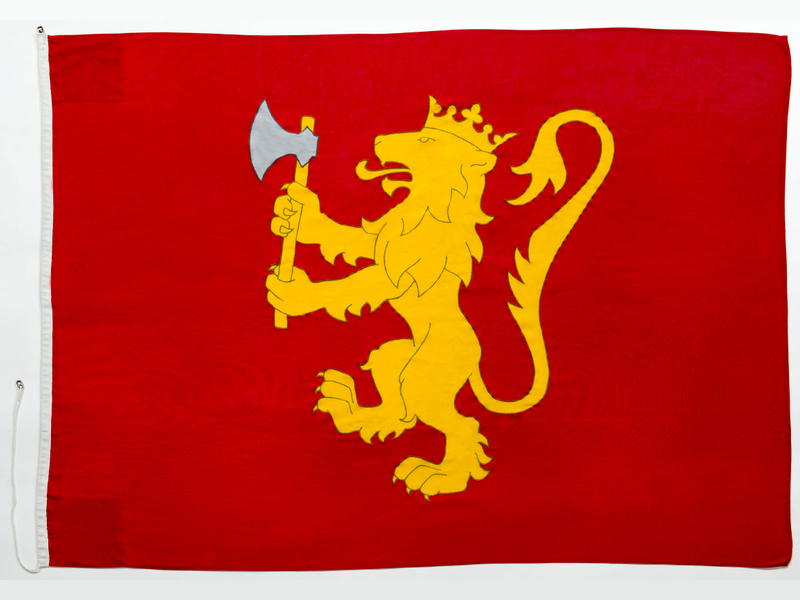 Both the Royal Standard and the Standard of the Crown Prince depict the Norwegian lion in gold bearing a silver axe on a red background. The flags are the same size but the flag of the Crown Prince is swallow-tailed. The National Flag is the Norwegian flag. The State Flag resembles the National Flag but is swallow-tailed and has a third tail (the “tongue”) between the two other tails. 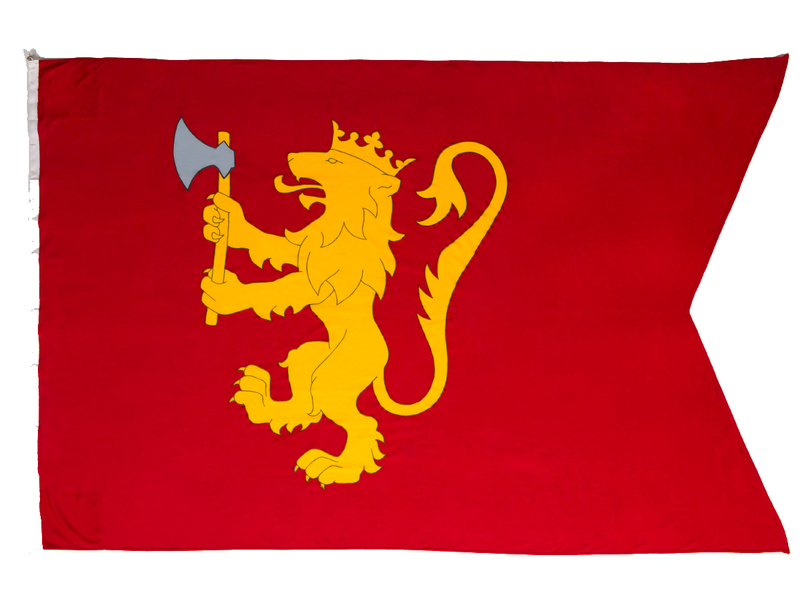 The Royal Standard is flown whenever the King is in Norway or Norwegian territories. There are, however, two exceptions to this: If the King is in residence at Stiftsgården in Trondheim or is on board the Royal Yacht Norge (and in Norwegian waters) neither the Royal Standard nor any other flag is flown over the Royal Palace. The flag pole at the Palace remains bare. The reason for this is that on these occasions the Royal Standard is hoisted either at Stiftsgården or on the Royal Yacht and the Royal Standard is never flown in two places at once. When the King travels abroad, His Royal Highness The Crown Prince is Regent. On such occasions the Standard of the Crown Prince is flown over the Palace. The changing of the flags takes place as the King leaves the country. If both the King and the Crown Prince are out of the country, the State Flag is flown above the Palace. The flag is changed as the Prince Regent leaves the country. Normal rules for flags do not apply to the Royal Standard and the Standard of the Crown Prince. These two flags may be flown all day long and are hoisted and lowered according to the rules outlined above. The State Flag, however, is flown according to normal rules for flag raising and lowering. A medium-sized flag, which is the one normally used. An extra large flag used on official flag days and on special occasions such as state visits. A small storm flag that is used when the winds are strong. Sometimes flags are flown from the balcony of the Royal Palace as well as – or instead of – from the roof. This is the case, for example, if it is an official flag day and the King is at Stiftsgården or on the Royal Yacht (in Norwegian waters). On such occasions the flag pole on the roof remains empty and the State Flag is flown from the Palace balcony. Flags are flown from the balcony according to instructions issued by His Majesty The King.